(Kansas City, Mo. 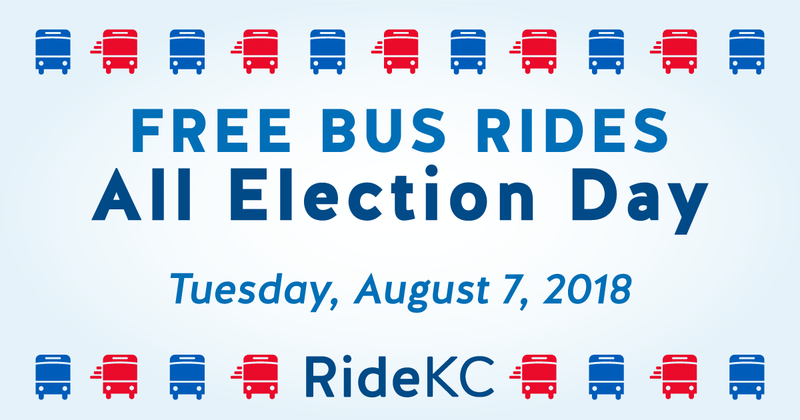 – Aug. 2, 2018) RideKC routes will offer free fares all day on Tuesday, Aug. 7, to make it easier for citizens to vote. On Election Day, fares on all RideKC bus routes serving Kansas City, Johnson County, Wyandotte County and Independence will be free. Paratransit will also be free to ride. To find your polling place and check your voter status, Kansas City residents in Jackson County can visit the Kansas City Election Board website. For other locations in Missouri, start with the Secretary of State’s website. In Kansas, Johnson County voters can access resources at Johnson County Election Office, and Wyandotte County election information is available at Wyandotte County Election Office. Kansas allows Advance Voting in person and by mail, in addition to voting at the polls on Aug. 7. The above websites can provide more details. For those who live elsewhere in Kansas, information is available at Vote Kansas.